Here is something for all the students and teachers out there. Jake Smallman & Carl Nyman Stencil Graffiti Capital Melbourne (Mark Batty Publisher 2005) See also their website. Alison Young, Ghostpatrol, Miso Street Studio – the place of street art in Melbourne (Thames & Hudson, 2010) Design and layout by Timba Smits. The book has interviews with Neils Oeltjen (aka Nails), Tom Civil, Tai Snaith, Ghostpatrol, Ash Keating, Al Stark, Miso, Twoone, Mic Porter, and the Everfresh Crew. There is an excellent review of this book on Hyperallergic. 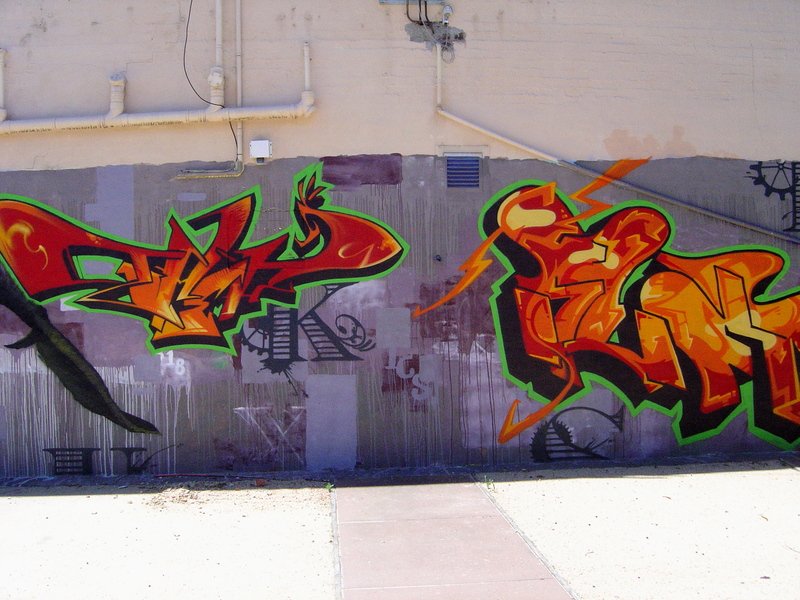 As well as these books, I must also recommend, even though it is not about Melbourne graffiti – “How to read Graffiti” by Jason Dax Woodward (13/6/99) This well written introduction to aerosol graffiti is worth reading for people outside of graffiti culture. The article is strictly about old school aerosol graffiti but it is good to start at the beginning. In the beginning was the word. The word was often a name, a tag, repeated, endlessly, like Taki 183 who is often cited as the first graffiti artist. “After working on the tag form for an indeterminate period the writer inevitably beings on developing a piece style. This process might involve working on throw ups first or straight into rounding out the tag into a piece form.” (p.4) The enlarged tag refined, areas of colour are filled in, clouds or other background are added, along with highlights and a “keyline” running around the outside of the piece. The addition of characters, cartoon or realistic, further completes the background of the piece. These words, the basic vocabulary that Jason Dax Woodward explains are the way graffiti or street art is defined, described, designated and denoted. It is the ghostly theory, the invisible culture behind the visible images that allows them to mean something, to be compared, even, to be discussed. These verbal definitions run like a “keyline” in the mind around graffiti. Please add to this reading list in the comments. This entry was posted on Tuesday, March 8th, 2011 at 7:49 PM	and tagged with books, ghostpatrol, graffiti, Kings Way, Melbourne, Miso, Stencil Graffiti Capital Melbourne, Street Art Uncut, Street Studio and posted in Book Reviews, Street Art. You can follow any responses to this entry through the RSS 2.0 feed. Yes, I must read it. I’ll have to find a copy at a library somewhere. Thanks for mentioning Street/Studio, Mark….